Every child deserves to be loved and cherished, especially when their family is suffering. 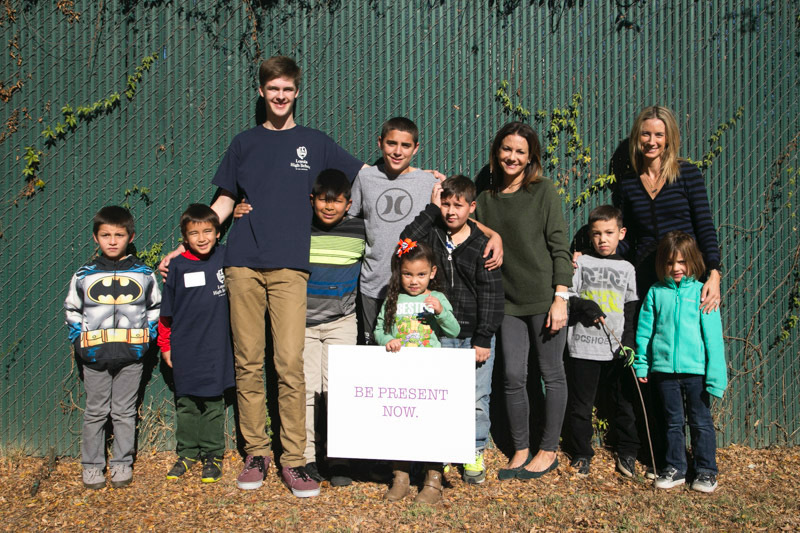 PRESENT NOW was founded in 2012 by Erica Fisher and Melanie Neumann and is dedicated to supporting children and teens entering and living in transitional domestic violence shelters. 1 in 15 children in the United States are exposed to intimate partner violence each year and 90% of these children are eyewitnesses to this violence per the National Criminal Justice Reference Service www.ncjrs.gov. The mission of PRESENT NOW is to provide disadvantaged children with both essential goods and specialty items to help bring them joy, comfort, and relief during a time of crisis through their signature Presents Program. The Presents Program assists mothers and their children entering domestic violence shelters. The program consists of three presents given throughout a child’s stay at the shelter; the Presence of Mind box is given in August and contains a new backpack filled with school supplies. The Presence of Love box is delivered on Valentine’s Day and includes an electronic learning device. The final box is the Presence of Being box. This box is given to a child on their birthday and includes: a new outfit, toy, book, cake mix, frosting, spatula, candles, and restaurant gift card to celebrate their birthday outside the shelter with their mother. The program is based around the idea that giving consistently to children who are severely traumatized in a thoughtful and personalized way, can have a huge impact on how they recover and rebuild. The program also supports the mothers who would otherwise be unable to provide gifts by lifting both emotional and financial burdens. 94.8% of shelter mothers reported that they would not have been able to purchase a digital toy/learning device or backpack with school supplies for their children without the help of PRESENT NOW. Today, on #GivingTuesday, your contribution to our Presents Program will allow mothers and children suffering from domestic violence to find peace, joy and comfort during a time of crisis. To date, PRESENT NOW has wrapped and delivered over 3,800 gifts to children throughout the state of California supporting 34 shelter locations and over 560 children statewide. Currently, there are plans to expand their program nationally to the east coast. To make a donation, click here. To learn more about PRESENT NOW, visit www.presentnow.org. Erica Fisher and Melanie Neumann are both mothers living in Southern California with backgrounds in philanthropy, social work and social activism. In 2013, they formed PRESENT NOW, a 501c3 organization with the mission of providing comfort, relief and support to children entering transitional domestic violence shelters in California. In 2015 alone, there were 500,976 reports of child abuse and neglect in the state of California. Research confirms that one of the driving factors in the emotional and psychological suffering of these children is they often feel irrelevant in the face of the violence they experience. Our organization offers a “presents program” consisting of three separate gift contributions throughout the year to children living in transitional domestic violence shelters—a birthday package consisting of a new outfit, toy, book, restaurant gift card, and a cake mix, spatula and frosting for their mother to make a homemade cake; an electronic learning toy at Valentine’s Day; and a new backpack filled with school supplies in August. When we began gifting in 2013, we started with 2 local shelters in Los Angeles. In the past 6 years we have expanded our partnerships to include 34 transitional domestic violence shelter locations throughout the state of California gifting to over 560 kids a year. We have current plans to expand our program to New York City in 2019.